OK - let's get one thing straight. 'Intense' is a complete over-exaggeration with these eye shadow trios. If Collection 2000 think that the colour payoff in these tiny palettes is 'intense' then I dread to think what their version of 'subtle' is - none existent? I don't like to gripe but the colours in the palette look nothing like the colours in the swatches - hell from the pink palette I struggled to see the swatches on my wrist in reality so I can only apologise for you having to squint at your computer screens to see them on my lily-white wrist in cyber-space (they would possibly show up on darker skin than mine but shouldn't they really cater for all skin colouring considering Collection 2000 market to such a wide audience?). Hello? Collection 2000? Where is the pigment?? The palette of 'natural' colours is called 'Cookie Dough' and the colours show up OK, although not to the intensity that I would prefer. I had issues getting the colours to even wipe onto my finger to swatch these as they're so tightly compressed. In complete opposition to this experience, the pink palette is called 'Sandcastle' (because, you know, when I think of the beach I think of pinks...) and the colours were too easy to swatch. The palette wasn't even dropped or smashed but there was so much product fall out that my once black rug in my living room is now a shimmering mess. That's right - shimmer. There is a lot of that, I can assure you. Well, I would tell you the price and give you the link but I personally don't want any of you as disappointed as I was with these. They were a complete waste of money and I will never use them. 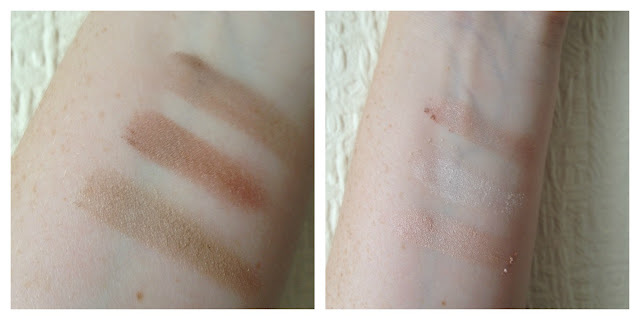 I haven't used them at all, apart from these swatches, since I bought them over 4 months ago. I apologise about my little rant here but really, I think these palettes were a complete waste of time and money - I'm only being honest. I don't want to recommend something to any of you for you to think I was lying to you. I'm actually relieved to read a bad review! I don't think I've ever read a review as honest :P Thankyou for letting us all know, brilliantly written :) I do like Collection 2000 but I've never even seen these palettes! Hahaha fab review! Honest and to the point! Won't be trying these then...!